Ruth Higham sadly died on 1st August 2015. For the time being we have left this website up should anyone happen to come to its pages and enjoy her creativity. 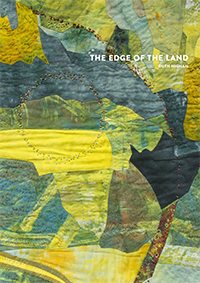 Ruth's book about the creative process "The Edge of the Land" is now on sale for delivery in mid-December 2015, proceeds will go to The Beatson Hospital. If you would like a copy please click here. It was a walk in the Ashdown Forest. It was 1996. Our children were 15, 12, 10 & 9. What was I going to do when they had left home? What did I want to do with the rest of my life? As Richard and I walked the sandy open country we talked about the options. It was one of those moments which in retrospect were pivotal; that would change everything. Retrain as a midwife?, make my fortune as a …? Sit and gaze at the photographs of children in my newly empty house? It had to be something I was passionate about; that was not just a non-negative; that would stretch my creativity, lead me to people, engage me entirely. That conversation led to an adventure that has taken in City & Guilds, Quilt Judging, The Loch Lomond Quilt Show, making quilts and meeting quilters. It has taken me to places I had dreamed of and had never dreamed of. This website shares some of my passion for textiles, quilting and patchwork. People who quilt are in one way very private. It is a personal world of ideas transformed into three dimensions. But it is also a very populated world in which friendships are formed and built and transformed. Welcome to this space.